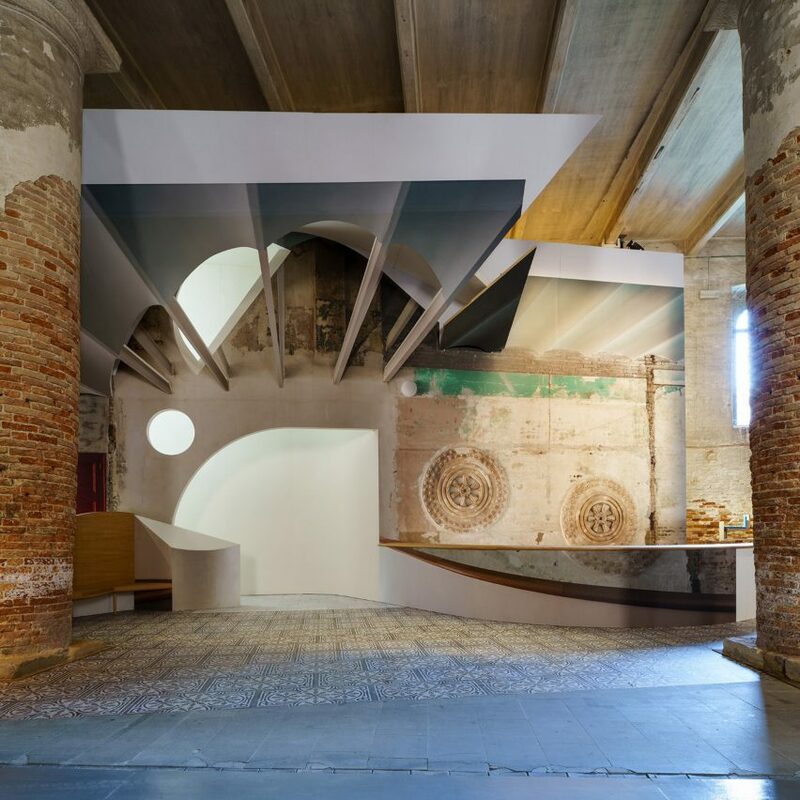 This year’s Venice Architecture Biennale is bursting with models, including several you can touch or inhabit. Dezeen’s social media editor Danil Boparai picks 10 of the best examples. 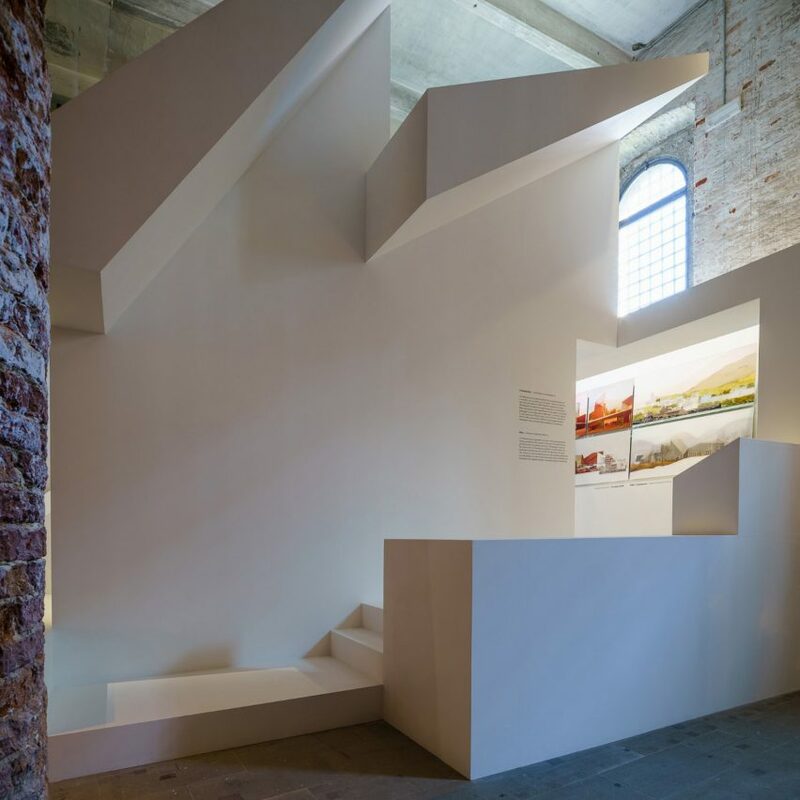 London architect Alison Brooks has built four different “inhabitable” totems inside the Arsenale, each designed to offer a different experience of light and volume. 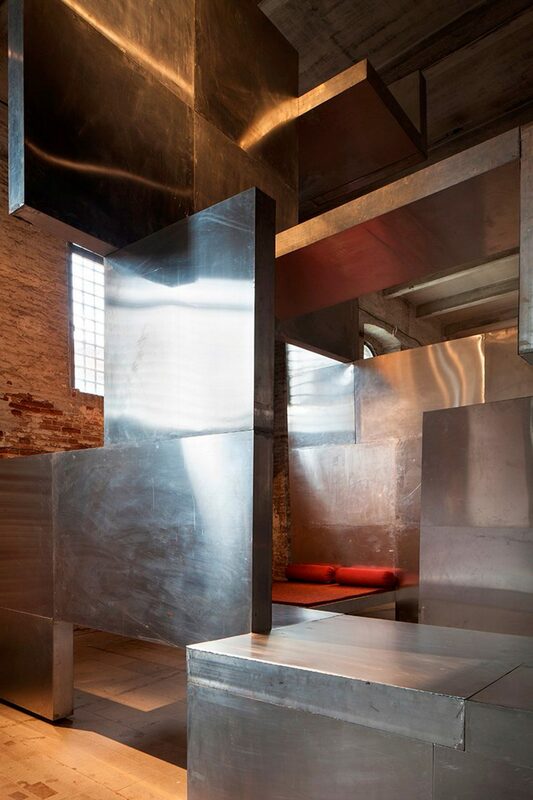 One contains a staircase, while another is lined with concealed mirrors. 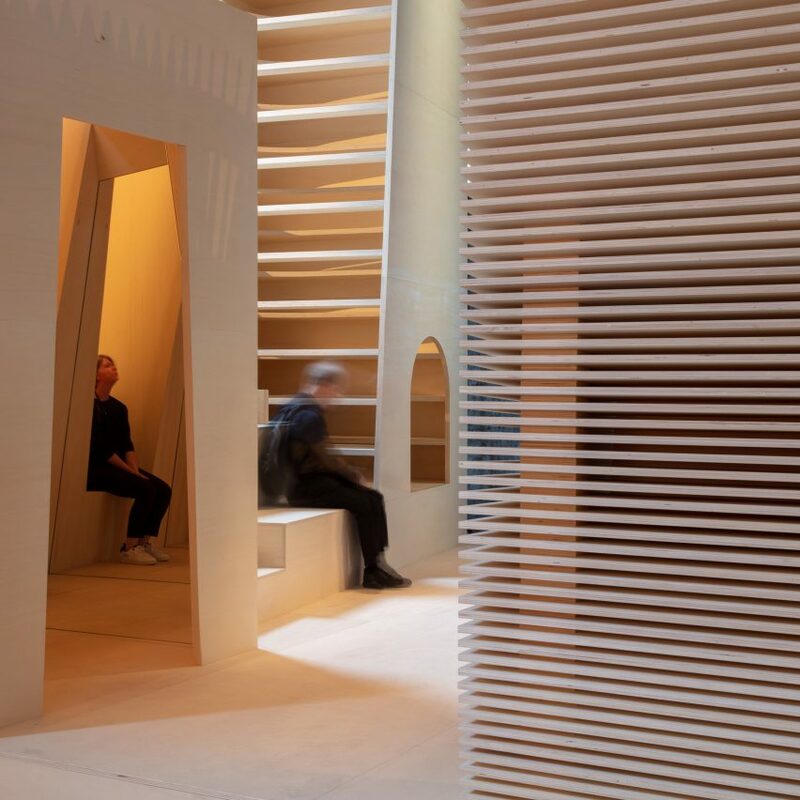 Irish firm O’Donnell + Tuomey has built a “Siamese twin form” that merges elements of two projects – a completed civic space in Ireland and a competition entry for China. 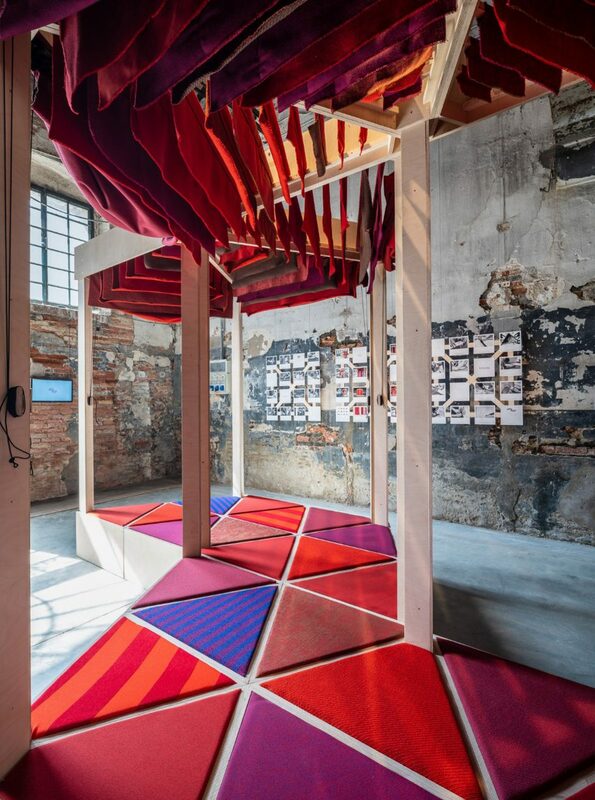 It integrates a series of pathways, so visitors can climb over it in a number of ways. Diébédo Francis Kéré is showcasing a lounge structure he designed for Berlin’s former Tempelhof Airport, which is currently being used as a refugee centre. 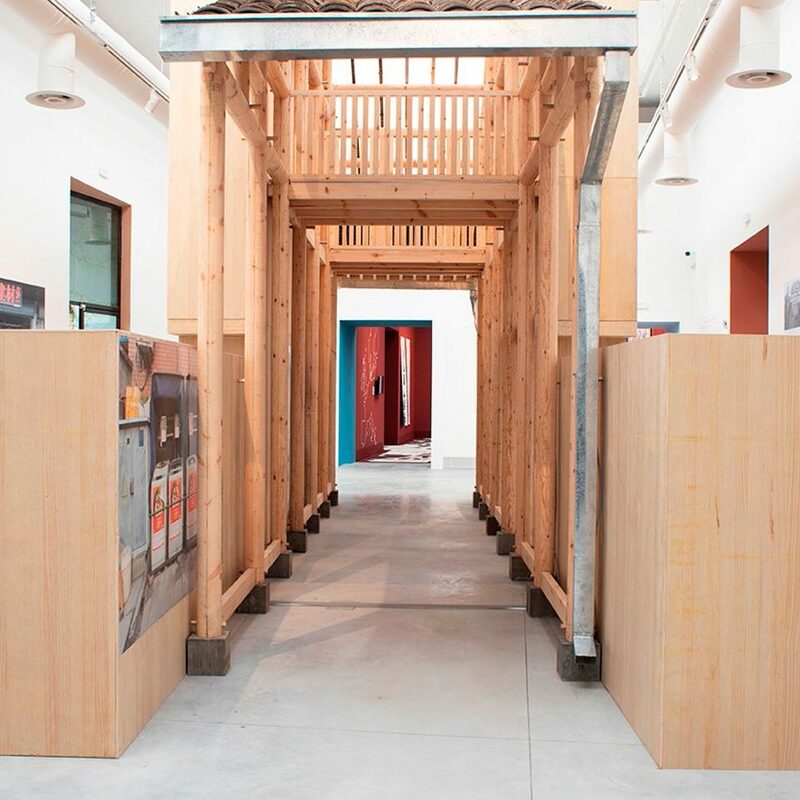 His aim is to provider social spaces where the community can interact with one another in comfort. 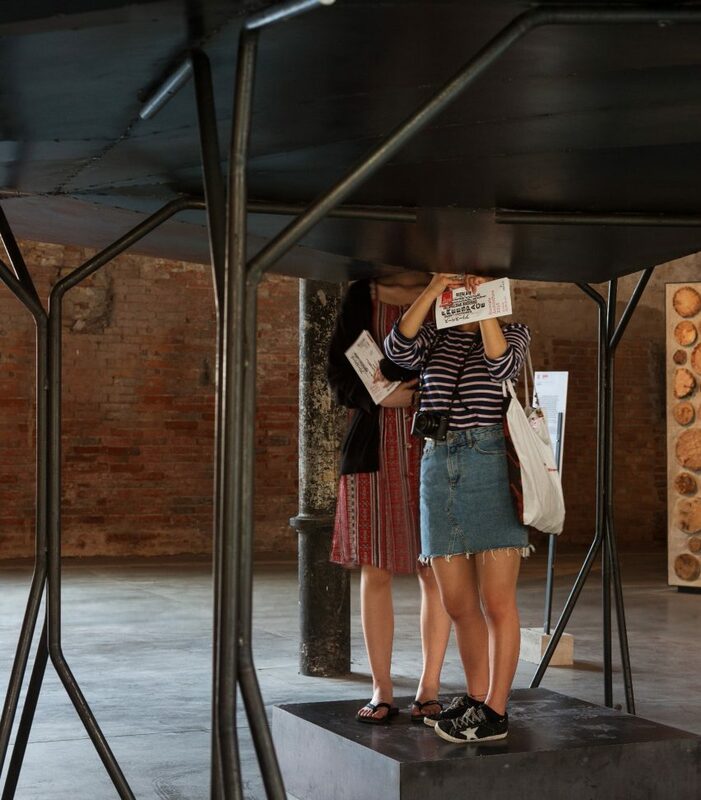 Over in the Central Pavilion, the Wang Shu-led Amateur Architecture Studio is showing a prototype of a “gap space” – a type of illegal structure that often pops up in China’s urban villages, and which the studio believes could offer new opportunities. 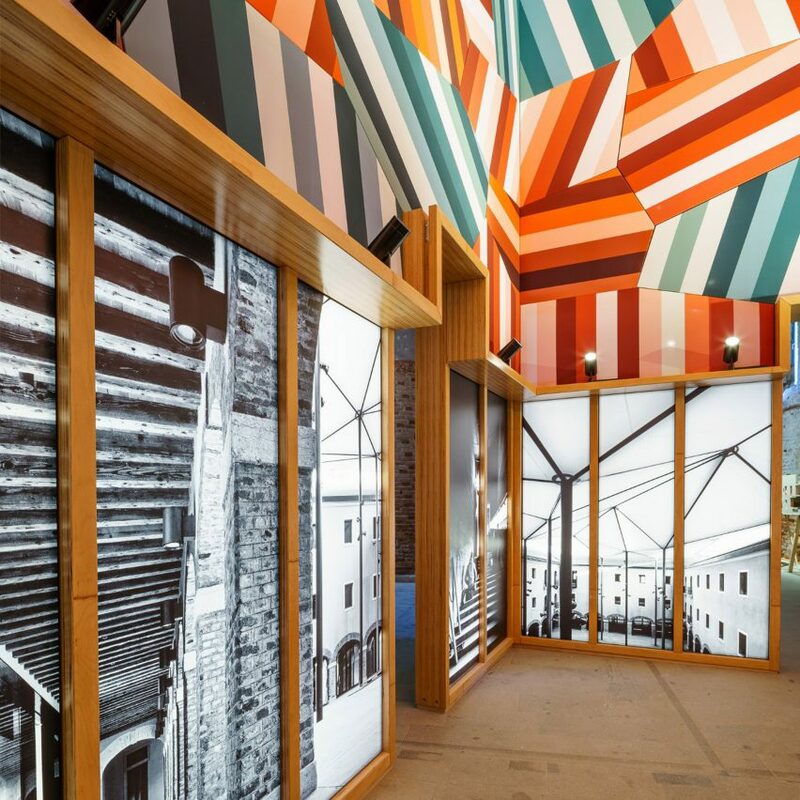 This vibrant installation by German architects Saurbruch Hutton shows an abstract take on the colourful M9 Museum, a proposal by Berlin studio Saurbruch Hutton. Inside, visitors are invited to sit down and take in a series of black and white photographs of the site’s heritage. 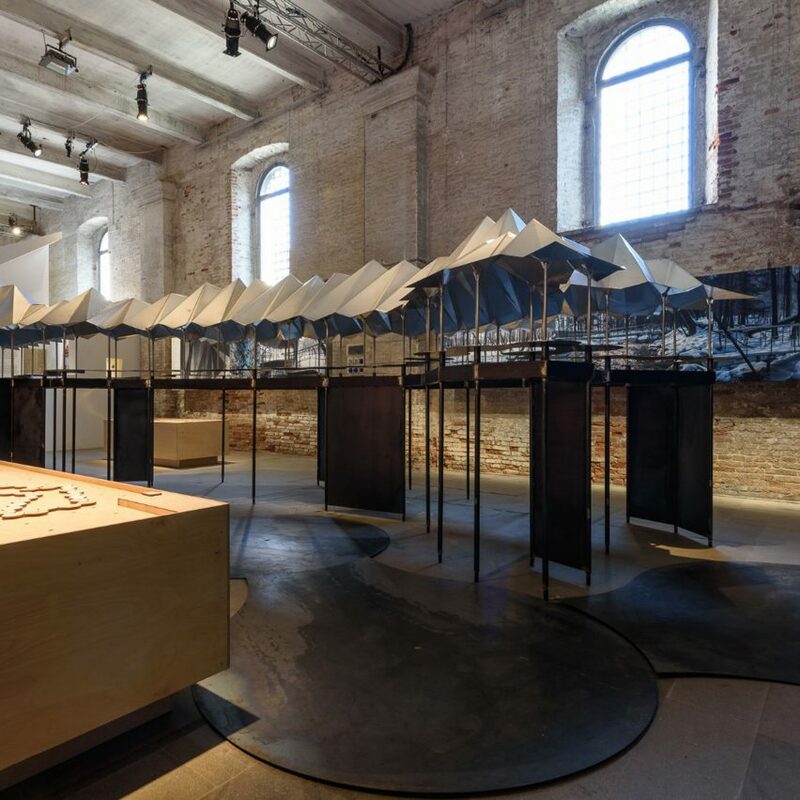 Jensen and Skodvin’s metal structure gives visitors the chance to walk under a scaled-down reconstruction of a canopy the studio designed for a waterway in a Chinese forest. 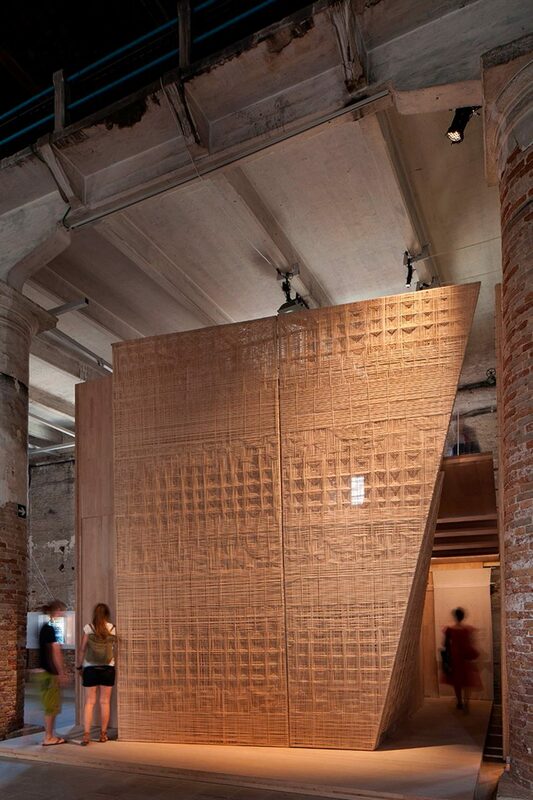 Visitors are invited to walk down the centre of the model and see the shelter from underneath.